First of all, thanks to HarperOne for sending me this review copy. 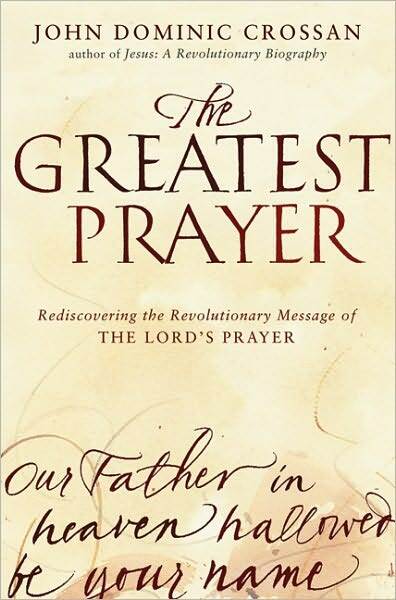 When noting the main title of this book, The Greatest Prayer, I am not sure many people would be drawn to it. ‘Is it another Prayer of Jabez type book?’, one might ask. The subtitle gives more clarity into the subject matter of the book, Rediscovering the Revolutionary Message of the Lord’s Prayer. Still, I’m not sure many would be drawn to a book discussing what we call ‘the Lord’s prayer’. Even more of a hurdle, at least for evangelical Christians, is the reality that the book’s author is John Dominic Crossan. For many evangelicals, this name has been seen as a blemish upon Christianity. Why? Crossan was the co-founder of the Jesus Seminar and a proponent of what is known in scholarly circles as higher criticism of the biblical text. So, from the beginning, I believe this book does not lend itself to drawing too many people in, at least from the evangelical Christian perspective. Having said that, if a student of the Scripture has the opportunity to engage with the book, I think it would be worth taking up the challenge and not simply discard it as second-rate. This was my first opportunity to engage with the writings and work of Crossan and there is no doubt he stands as a very knowledgeable biblical historian and archaeologist, not to mention that some of his theological thoughts are quite perceptive. Again, I have no doubt that many evangelicals will struggle with a few of Crossan’s beliefs – he does not accept the view of substitutionary atonement; he believes that addressing God as Father comes more out of an ancient patriarchal context and that this word, in our culture today, should be better re-translated as the Divine Householder; or some of his more inclusivist thoughts that come across the pages – he actually does have some very solid things to teach, at least as I see it. Please know I don’t agree with all things stated, but he has some very insightful knowledge into the history, language, culture and context in which Jesus gave us ‘the greatest prayer’. One of the interesting things that Crossan brings out from the Lord’s prayer is his view that this prayer was most likely a later development from the Abba Prayer in Paul’s letters (i.e. Gal 4:6 and Rom 8:15). This view of the later development of the Lord’s prayer stems from the belief that the Gospels present more of a perspective on Jesus within the early church community rather than what Jesus actually taught and did. While I would not personally agree with this perspective, it is interesting to note the possible connection between the prayer of Jesus and the Abba prayer of Paul. Still, in many ways, Crossan is able to bring out the theology, language, culture and context of the prayer within that first century Jewish perspective. And to see the Jewish poetic parallelism within the prayer was beautiful. It leaves little doubt that the prayer was given in such a way to easily remember. And today, even with our varying language translations, the prayer still carries a flow as it is repeated on a daily basis by millions of Christians (though that flow might not compare to the original). Despite the fact that the book looks like it would only be a devotional text (simply viewing the cover and noting it’s 190-page length), though it actually does carry a devotional flavour at times, it also offers helpful insights into the Lord’s prayer from the varying camera angles of theology, history, language and culture. Even more, though I can guarantee many evangelicals finding difficulty with Crossan’s approach to some topics discussed (more unfolds the further one reads), if any Bible student would like to delve into more study of the Lord’s prayer, this is definitely a resource worth having. This entry was tagged book review, books, John Dominic Crossan, Lord's prayer. Bookmark the permalink. I think this makes the most sense as the sermon on the mount was basically a rehash of Israel’s obligations / expectations of social justice that was already established in Torah…. Good thoughts, Craig. It would make sense for Jesus to draw on some things that were established. So when asked how they should pray, he takes something they have and probably brings some better focus on it. Crossan has long traded in the Irish soda bread of Celtic Christianity for the Jewish challah of tikkun olam (Apparently he hasn’t yet discovered the connection of Pater Noster to Kaddish Yatom. Maybe in a sequel??? ) The book does no credit to biblical Christianity and is typical of the same ilk that only Harper One has a market for. The so-toted scholarship of these deconstructionist authors is personally agenda -driven. (As though the doctrine of substitutionary atonement started with Anselm!! Did he flunk Patristrics or what?) I would never spend money on these books. I borrow them from my library which is dumb enough to think they’re giving the reading public a balanced assessment of the topic!